Hurll Nu-Way Pty Ltd is the new authorised distributor of Hitachi air compressors in Australia. The world-leading multinational engineering and electronics company, Hitachi has been manufacturing compressors since 1911 and is famous for its piston, scroll and screw compressors used across a broad range of industry applications. Backed by over 30 years of expertise in supplying and repairing blowers and compressors for Australian energy, manufacturing and water businesses, Hurll Nu-Way now adds Hitachi compressors to their extensive product range to provide further solutions for their clients. New Hitachi products available from Hurll Nu-Way include oil-flooded type HISCREW compressors, oil-free scroll compressors, and BEBICON piston air compressors in oil-free and lubricated versions. Available in an initial range from 11 kW to 37 kW in fixed speed and variable speed options, oil-flooded type HISCREW compressors are used in general industry as well as food and beverage, paint, dairy, metal, wine and electronic industries for industrial and service air applications. Feature highlights include simple maintenance, energy saving and simple operation, exclusive HISCREW 2000 oil for long life, spin on cartridge oil separator element, variable speed units with Hitachi inverters, and MEPS compliant motor. Series SRL compressors ranging from 2.2 kW to 22 kW are used in hospitals for HVAC as well as in pharmaceutical, chemical and petrochemical laboratories for testing processes. Feature highlights include 100% oil-less design, OEM manufactured, low sound levels, low vibration design, compact and space saving, innovative design of tip seals, and MEPS compliant motor. 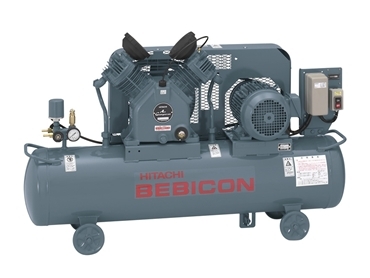 Available in both oil-free and lubricated versions, BEBICON piston air compressors range from 0.4 kW to 11 kW, and are ideal for smaller applications in mining, building, metalworking and engineering. Feature highlights include high performance, high reliability, compact and lightweight design, industrial quality, AS1210 certified receiver tank and MEPS compliant motor.Working with Hitachi, Hurll Nu-Way is confident of providing their customers across Australia integrated and value-added solutions for all compressed air needs including aftermarket service and spare parts availability.